Dear Erich is inspired by 200 newly discovered letters written in Germany between 1938 and 1941 by Herta Rosenthal to her son Erich, the composer's father. Dear Erich tells a refugee story for our times. How can a family cope as the walls of their nation's hatred close in around them? For those who escape, what lies ahead? Erich, a Jewish academic, escaped Nazi Germany to the U.S. shortly before Kristallnacht. The opera tells the story of a family's dual fates. Erich's journey to a new life in the new world - his studies, jazz and love - while the situation deteriorates in Germany and his family ultimately meets their cruel demise at the hands of the Nazis. Frustrated and powerless to help them emigrate, Erich must live with deep survivor guilt which affects him in his relationships with his wife and children. The opera's scenes of immigration and refugees in crisis raise moral dilemmas that resound to this day. Finally, Dear Erich stands for the power of remembrance, not just to honor the past but also to root us in the present and chart our future. 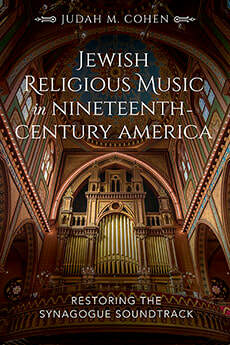 In Jewish Religious Music in Nineteenth-Century America: Restoring the Synagogue Soundtrack, Judah M. Cohen demonstrates that Jews constructed a robust religious musical conversation in the United States during the mid- to late-19th century. While previous studies of American Jewish music history have looked to Europe as a source of innovation during this time, Cohen’s careful analysis of primary archival sources tells a different story. 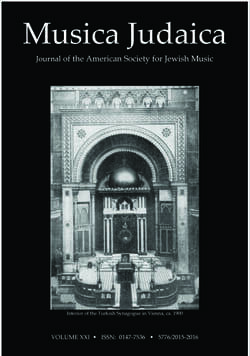 Far from seeing a fallow musical landscape, Cohen finds that Central European Jews in the United States spearheaded a major revision of the sounds and traditions of synagogue music during this period of rapid liturgical change. Included in this volume is Edwin Seroussi’s seminal article on Sephardic Liturgical Music in Southeastern Europe at the Turn of the 20th Century; an article on David Krakauer’s Klezmer Madness! ; an interesting article about the New Contexts and New Audiences for Pyyutim; memorial articles about André Hajdu and Amnon Shiloah, including a complete list of his publications. ​Musica Judaica is Included as a part of membership dues in the American Society for Jewish Music for 2016-17. Your 2016-17 membership dues (Sept. 1, 2017 - Aug. 31, 2018) are an essential part of the funding that allows the American Society for Jewish Music to continue to operate. Membership dues support the annual Chanukah Concert and our contemporary concert Music in Our Time, among others during the season. The sessions of the Jewish Music Forum, both at home and "On the Road" are also supported by dues from members. And, importantly, the information and access we provide without charge to the St. Petersburg Score Collection, the Charlie Bernhaut Collection of Jewish and Cantorial Recordings, as well as a host of other activities and services which help keep Jewish music alive. You can join the Society, or to renew your membership online, or download the membership form and mail it in.